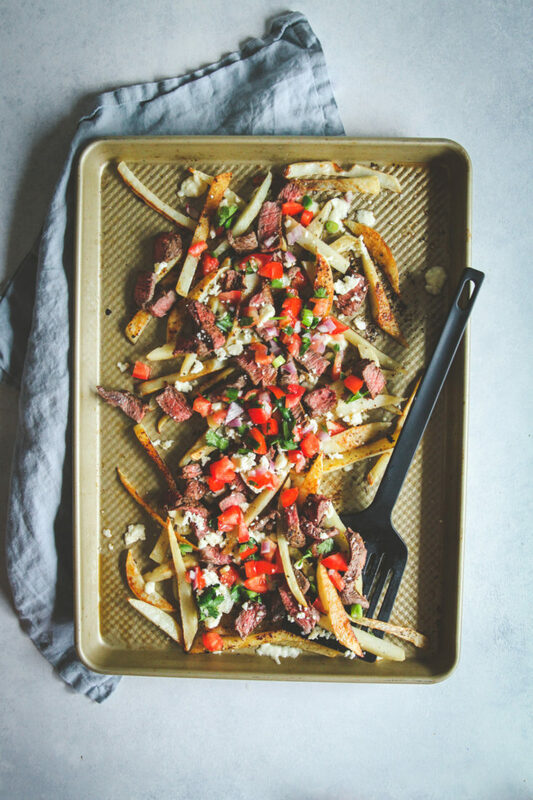 These carne asada fries are such a great party food (or one pan dinner), you’ll never even know they’re healthy! The carne asada fries are loaded steak fries taken to the next level, and are an easy and delicious meal everyone will love! 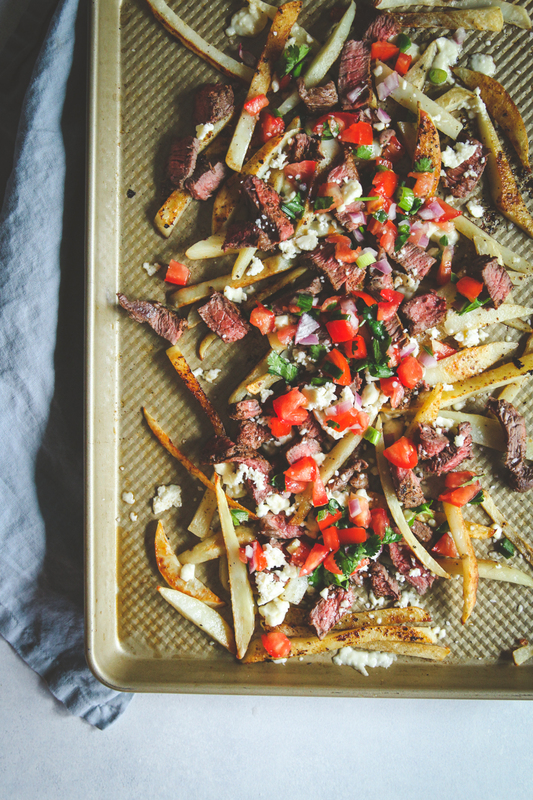 Fries topped with flavorful steak, pico and cheese, YUM, and are from the new Skinnytaste One and Done cookbook! 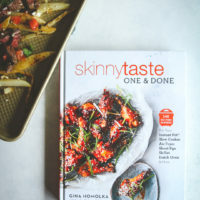 I’ve been so excited for Gina’s (from the super popular and amazing blog Skinnytaste.com) new cookbook. It’s called Skinnytaste one and Done: 140 No Fuss Dinner For Your Instant Pot®, Air fryer, Slow Cooker, Dutch oven, Sheet Pan, Skillet, and more, and it’s AMAZING! The cookbook is full of 140 healthy and delicious recipes that are big on flavor and low on calories and cleanup. Just my style! 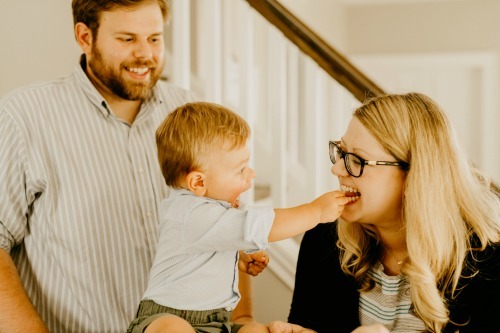 Being a new mom, it can be hard to find recipes that are healthy and delicious. But with this cookbook, dinnertime just became that much easier. I swear I’ve bookmarked every single recipe to try, they all sound SO good! 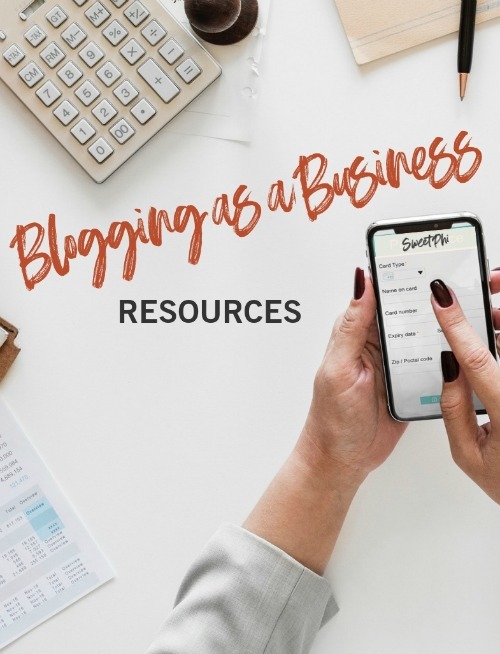 Gina is one of the kindest and most awe inspiring bloggers (suuuuper successful yet generous and down to earth) I know, and I could not be more excited for her new book. Every recipe I’ve ever made of hers (and that’s a lot, including the best turkey tacos I shared on the blog from her last cookbook) turns out SO GOOD and becomes a favorite. Her books definitely are on my list of favorite cookbooks, and this one will be added to it! 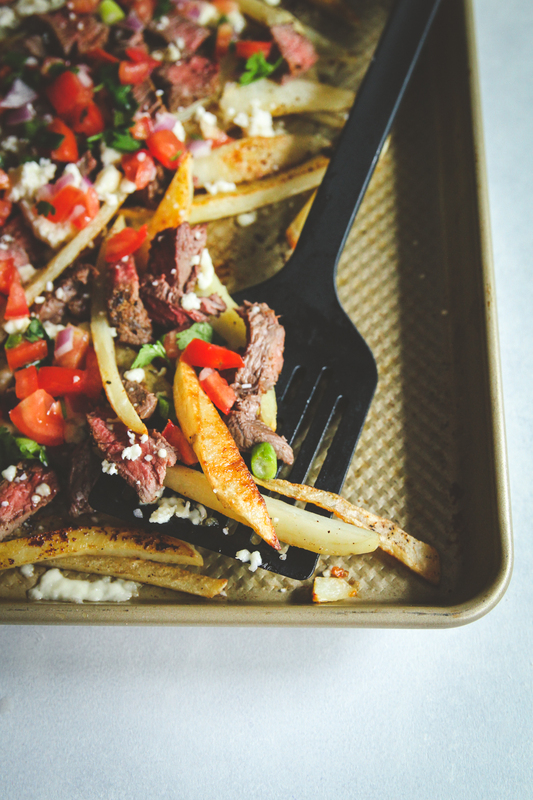 Just like with these carne asada fries, they’re sooo good, you’re going to be shocked when you find out they clock in at 436 calories per serving if you’re having them for dinner! I served them as an appetizer and it served 6 adults, so 145 calories per appetizer serving!! 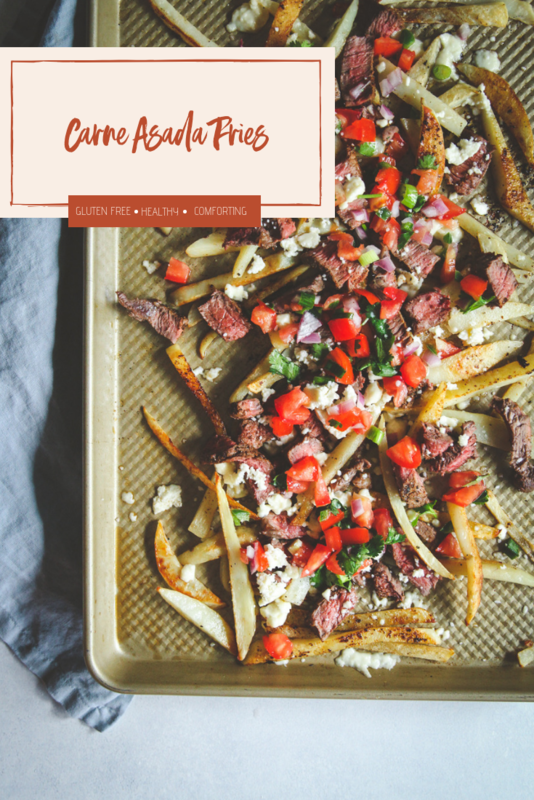 A few months ago I had carne asada fries at a restaurant for an appetizer and I loved them so much, I had them on my idea list to make for the blog! When I was going through the cookbook, they immediately jumped out at me and then I asked on Instagram which recipe you guys wanted to see. The resounding answer (86% of people answering the poll) said they wanted to see carne asada fries, so here they are! 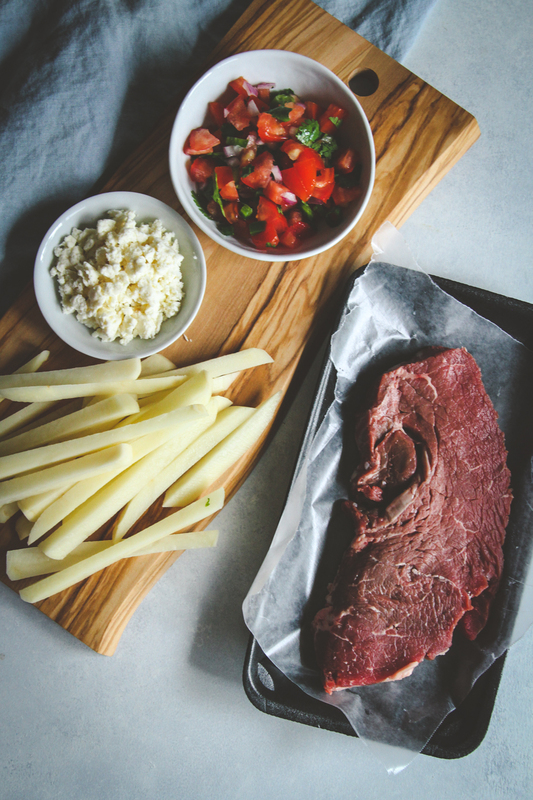 You make super flavorful carne asada and let it rest while you make crispy fries on a sheet pan (these ones are my favorite sheet pans) then you top the fries with cheese and the steak, broil it, and then top everything with pico. The end result are loaded steak fries you’re going to enjoy bite after bite! 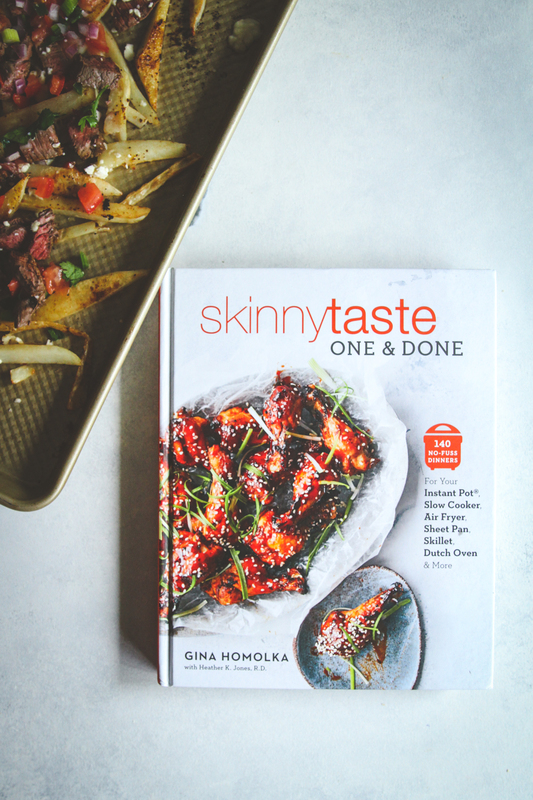 I cannot recommend the Skinnytaste One and Done cookbook enough. I’ve already made two recipes (in the last two days) and cannot wait to put my beloved Instant Pot (I just shared this sweet potato and sausage soup) and Air Fryer (I’ve loved sharing recipes like this crispy cheesy chicken)to use making these recipes. Adjust oven racks in top and bottom third of oven. Preheat broiler to high. Coat a large rimmed baking sheet with cooking spray. Season steak with ½ tsp salt, cumin, ¼ tsp garlic powder and pepper to taste. Arrange on prepared pan. Broil on top rack 4 minutes. Turn; broil 1-2 minutes. Transfer steak to a cutting board; tent with foil. Reduce oven to 450°F. Coat pan with cooking spray. Cut potatoes lengthwise into ¼-inch slabs; cut each slab into ¼-inch fries. Place on prepared pan. Drizzle with olive oil. Sprinkle with ½ tsp salt and ¼ tsp garlic powder; toss well to coat. Arrange in a single layer. Roast in bottom third of oven 10 minutes or until browned on the bottom. Turn and roast 8-10 minutes or until crisp and browned. Remove pan from oven. Meanwhile, thinly slice beef across the grain; chop into small pieces. When fries are done, top with steak and cheese. Return pan to top rack of oven for 2 minutes or until cheese melts. Top with pico de gallo; serve immediately. I’ve been waiting all week for the weekend so I can make these. YUM! I hope you loved them as much as we do! I am having a hard time getting my potatoes to dry out and cook. Oh no!! Did you pat the potatoes dry after washing them? Also, sometimes I really like to just leave them in the oven to bake bake bake…so I’ll end up leaving them in for double the cooking time! I made this with some of my leftover pulled pork instead of steak and it came out delicious. I also cooked the potatoes in the airfryer before adding all the stuff on top of them. I love those recipe modifications you made, so happy to hear it came out great with pork too! Also, Love that you cooked the potatoes in the airfryer first, I bet that made them super crisp and amazing! Do you peel the potatoes first or just give them a good scrub?